Security is a major factor we consider when it comes to each and every deployment. WSO2 Enterprise Service Bus also capable of securing services. However, From ESB 4.9.0 , we can no longer apply security for a proxy service from Admin Console of the ESB. We need to use WSO2 Developer Studio version 3.8 for this requirement for ESB 4.9.0. 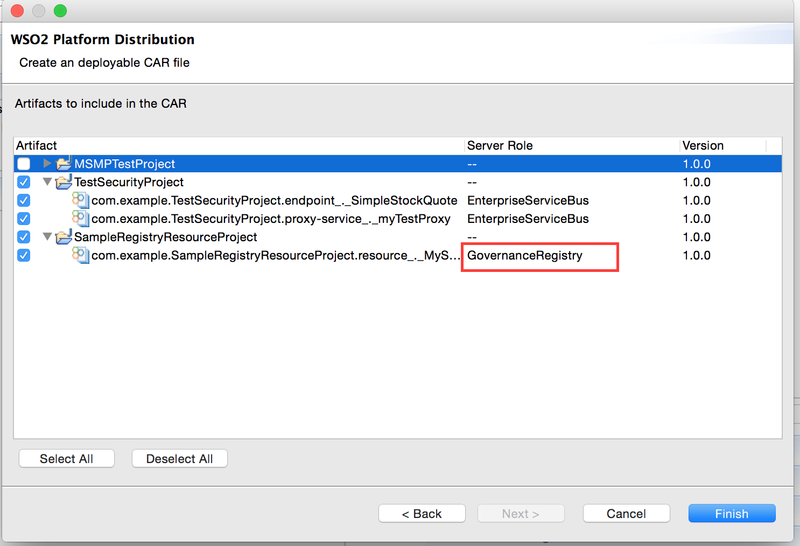 You can find the documentation on applying security to ESB 4.9.0 based proxy service here. However, i would like to add a small modification to the doc in  at the end. 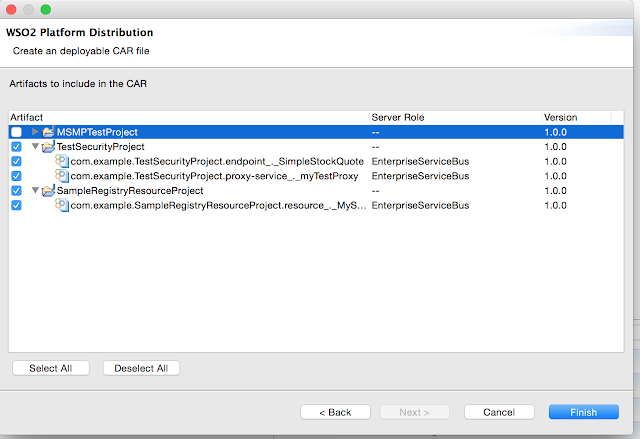 After securing the proxy according to the document, We need to create the Composite Application Project and export the CAR file. 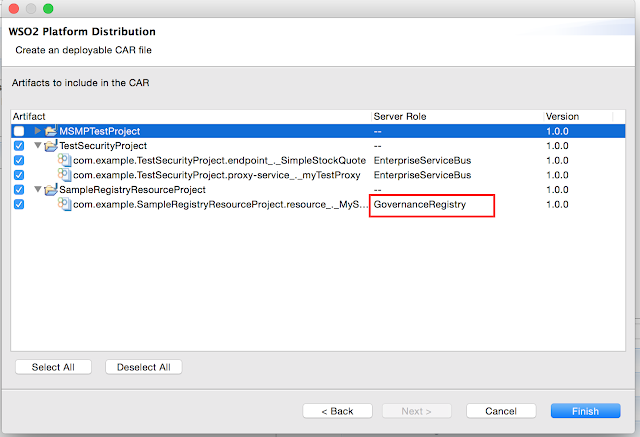 When exporting the CAR file, by default the server role of the Registry project is being selected as GovernanceRegistry as in the bellow image. 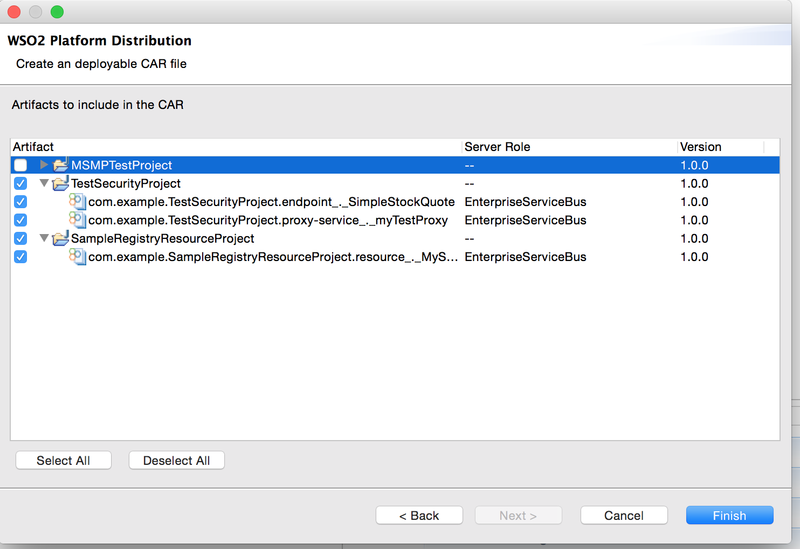 When we deploy that CAR file in ESB, We are getting following exception  due to above Server Role. In order to fix the problem, we need to change the server role to ESB as bellow since we are going to deploy it in ESB. [2016-04-12 14:34:48,671] ERROR - ProxyServiceDeployer ProxyService Deployment from the file : /Users/shammi/wso2/Support-Issues/MOTOROLAMOBPROD-44/wso2esb-4.9.0/tmp/carbonapps/-1234/1460496888659MySecondCarProject1_1.0.1.car/myTestProxy_1.0.0/myTestProxy-1.0.0.xml : Failed. [2016-04-12 14:34:48,672] ERROR - AbstractSynapseArtifactDeployer Deployment of the Synapse Artifact from file : /Users/shammi/wso2/Support-Issues/MOTOROLAMOBPROD-44/wso2esb-4.9.0/tmp/carbonapps/-1234/1460496888659MySecondCarProject1_1.0.1.car/myTestProxy_1.0.0/myTestProxy-1.0.0.xml : Failed! org.apache.synapse.deployers.SynapseArtifactDeploymentException: ProxyService Deployment from the file : /Users/shammi/wso2/Support-Issues/MOTOROLAMOBPROD-44/wso2esb-4.9.0/tmp/carbonapps/-1234/1460496888659MySecondCarProject1_1.0.1.car/myTestProxy_1.0.0/myTestProxy-1.0.0.xml : Failed. [2016-04-12 14:34:48,673] ERROR - AbstractSynapseArtifactDeployer Deployment of synapse artifact failed. Error reading /Users/shammi/wso2/Support-Issues/MOTOROLAMOBPROD-44/wso2esb-4.9.0/tmp/carbonapps/-1234/1460496888659MySecondCarProject1_1.0.1.car/myTestProxy_1.0.0/myTestProxy-1.0.0.xml : ProxyService Deployment from the file : /Users/shammi/wso2/Support-Issues/MOTOROLAMOBPROD-44/wso2esb-4.9.0/tmp/carbonapps/-1234/1460496888659MySecondCarProject1_1.0.1.car/myTestProxy_1.0.0/myTestProxy-1.0.0.xml : Failed. org.apache.axis2.deployment.DeploymentException: ProxyService Deployment from the file : /Users/shammi/wso2/Support-Issues/MOTOROLAMOBPROD-44/wso2esb-4.9.0/tmp/carbonapps/-1234/1460496888659MySecondCarProject1_1.0.1.car/myTestProxy_1.0.0/myTestProxy-1.0.0.xml : Failed. Caused by: org.apache.synapse.deployers.SynapseArtifactDeploymentException: ProxyService Deployment from the file : /Users/shammi/wso2/Support-Issues/MOTOROLAMOBPROD-44/wso2esb-4.9.0/tmp/carbonapps/-1234/1460496888659MySecondCarProject1_1.0.1.car/myTestProxy_1.0.0/myTestProxy-1.0.0.xml : Failed. Caused by: org.apache.axis2.deployment.DeploymentException: ProxyService Deployment from the file : /Users/shammi/wso2/Support-Issues/MOTOROLAMOBPROD-44/wso2esb-4.9.0/tmp/carbonapps/-1234/1460496888659MySecondCarProject1_1.0.1.car/myTestProxy_1.0.0/myTestProxy-1.0.0.xml : Failed.